North Carolina is preparing for a showcase season opening event when they face LSU in Atlanta. However, they find themselves in a spotlight they wanted no part of. It started with the accusation that Tar Hell players had unauthorized contact with agents, and now it is topped off by the charges of academic improprieties. Butch Davis' North Carolina squad is a preseason pick to be a legitimate contending force in the Atlantic Coast Conference. 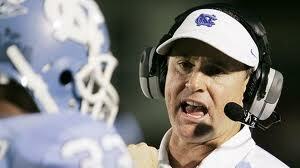 That may change if key Carolina players face suspensions. Neither of these investigations is expected to end any time soon, so the threat of them being long term distractions could become a detrimental factor to the success of the season as well. Regardless of how all of this plays out for North Carolina over the next few weeks, and even months, it does not bode well for the gridiron program in Chapel Hill. As they prepare to play in one of the biggest games that the Tarheels have played in a very long time, the attention is focused in a direction Davis had certainly not planned on when he took over the 'Heels in 2006. Now he must face the issues of allegations, as well as the grind of a 12 game season, head on and hope his program survives both. Not to mention his job as well.